It took a while, but another Android device has succumbed to Devs and hackers. The truly incredible, Droid Incredible, has been rooted. 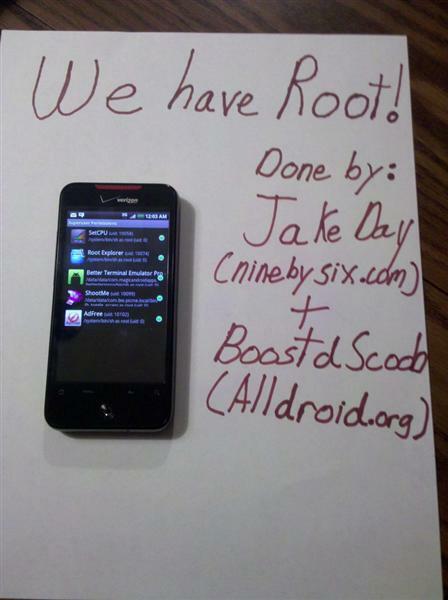 After being released over a month ago, Verizon’s new Droid Incredible was hacked by Jake Day and his Dev team. There was a little controversy surrounding the whole thing, I won’t go into detail about, really because I don’t know the real inside story, but in the end stronger minds prevailed. In a exclusive thread on the new AllDroid, a screenshot of the Droid Incredible with superuser permissions has been posted. There is also a follow-up thread on XDA, but all work will be posted exclusively on AllDroid. Now getting to that part of it, the actual Root instructions have yet to be posted, but Jake Day and boostdscoob promise that the instructions will be released very soon. I’m thinking we will probably see them either tonight or early tomorrow. So soon enough the true power of one the newest and fastest HTC devices, will be unleashed! Anyways if you want to follow the ongoing drama of the root, keep your eye on AllDroid, otherwise soon as the instructions are released, we will have them posted here at BlogsDNA! UPDATE: It has been reported to be FAKE! Jake Day and his people were apparently looking to scam people out of donations, XDA moderators have closed the thread and have started an investigation into the whole thing. UPDATE #2: It was not Jake at all or any member of his team, someone was impersonating him. So if you see the name ” Jake Day” on any Android forums, just know that this guy is the faker. Jake simply uses “jake” as his username on forums. I’ve been hearing good things about the Droid Incredible. Is this a CDMA based phone or GSM ? If CDMA, is there a GSM version ? Hey bro I appreciate the heads up, its was looking shady to begin with. Some users at DroidForums didn’t believe it to begin with. You need to show video proof, it’s too easy to photoshop images.